Porcupine Game Lodge & Incanda Safaris in specialises in Hunting Safaris, Eco Safaris and the breeding of rare/endangered species like Bontebok and Golden Wildebeest. Porcupine Game Lodge is located in the heart of the malaria-free Eastern Cape between Port Elizabeth and Grahamstown. The Farm is situated between the Bushman's River in the South and the Nazar River in the East with steep valley's and dense bush, the ideal habitat for Kudu, Bushbuck and Nyala. The upper part of the farm is less dense with various vegetation like the cape fynbos, proteas, scattered bush and grass land. This area is the perfect habitat for Impala, Bontebok, Duiker, Waterbuck, Buffalo, Red Hartebeest, Zebra and Wildebeest. There are also Giraffe, Warthog, Bush pig, Lynx, Ostrich and Jackal on the farm. If you love the outdoors, nature and exciting things to do, there is no better host than Josef Riener. He is a qualified Mechanical Engineer, Professional Hunter, Outfitter, Bush Pilot, Scuba Diver, and so much more. 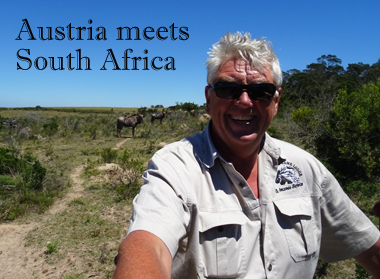 Born in Austria and following a successful career with a premium car company in Europe, Josef's love for the bush and wildlife drew him to settle in South Africa. He has been the proud owner and manager of Porcupine Game Lodge & Incanda Safaris, a very exclusive and private game farm since 2009.